Emilio Remelhe from ESAD College of Art and Design about "Is the Question the Mother of Knowledge?". Lecture by Dr. Mateo Kries - Director of the Vitra Design Museum. For more information, click here. Lecture by Eduardo Aires - Founder of the Studio Eduardo Aires. For more information, click here. Angela McRobbie from Goldsmith, University of London about "Settling Accounts with Creative Labour and Creative Industry Studies 1998-2018". Can't decide where to study or what? Graphic Design & Visual Communication, Product Design, Interior Design, Digital Business & Management, Organisational Psychology or International Management & Marketing - Berlin International offers these courses in English! Come and visit our university and get informed about our programs and in touch with our lecturers. Click here to learn more about the program. Asli Cicek from Catholic University of Leuven about "Narrations for Spatial Translations". Abigail Smith, Creative Director and Co-Founder of VerbalVisual will have a presentation about "Third Culture Design: The Nuances of Visual Communication across Cultures and Continents". For more information, click here. Camille Darroux will have a presentation about "How consumers are regaining power: An overview of the relationship between Digital Marketing, Influencer Marketing & Consumer Marketing". For more information, click here. Partner and Partner will talk about "Cradle to Cradle Design. For more information, click here. Janek Modzelewski, Head of Product Design at Archimedes Exhibition will talk about "Design (for) Space". For more information, click here. Caglar Yurtseven from Bahcesehir University about "Effects of major disruptive events on tourism". Deniz Karaoglan from Bahcesehir University about "Utilization of healthcare services of young children in Turkey: post reform period". More than 20 European Interior Educators will meet on 2.3.2019 at BI to found a network of European Interior Educators. Conveners of the meeting are Dr. Inge Somers (University of Antwerp) und Prof. Graeme Brooker (The Royal College of Art, London). The meeting will be hosted by Prof. Dr. Carola Ebert (Berlin International) and Prof. Carsten Wiewiorra (HS Ostwestfalen Lippe University of Applied Sciences). Two previous meetings were held in 2018 at The Royal College of Art, London, and the University of Antwerp. To round out the semester. 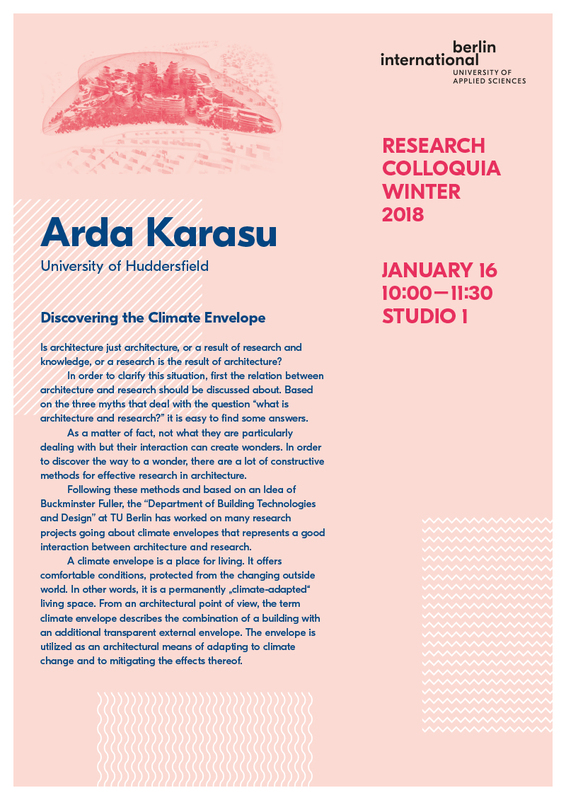 Arda Karasu about "Discovering the Climate Envelope". You can find all information here. For all students and staff members to get together to celebrate the upcoming holidays. Till Pliestermann about "Retail Environments for Luxury Brands". You can find all information here. Allmann Sattler - Wappner Architects about "Context as design driver". You can find all information here. 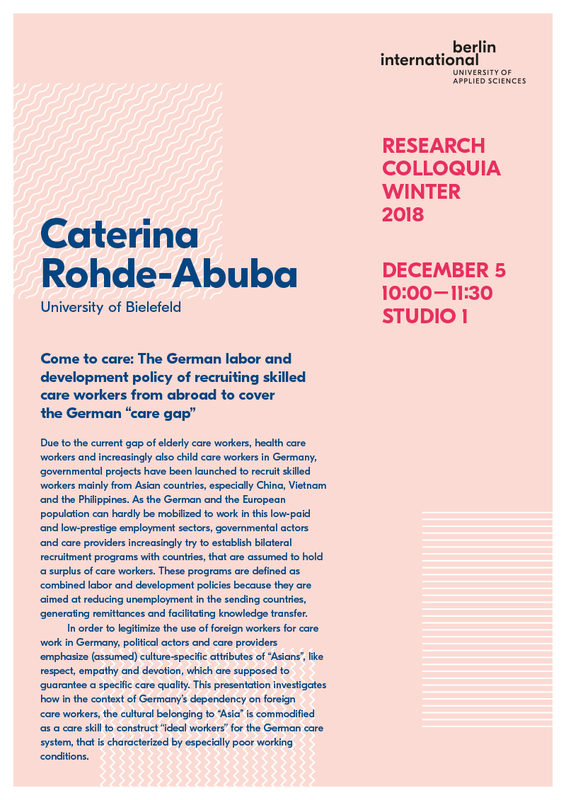 Caterina Rohde-Abuba about "Come to care: The German labor and development policy of recruiting skilled care workers from abroad to cover the German care gap". You can find all information here. 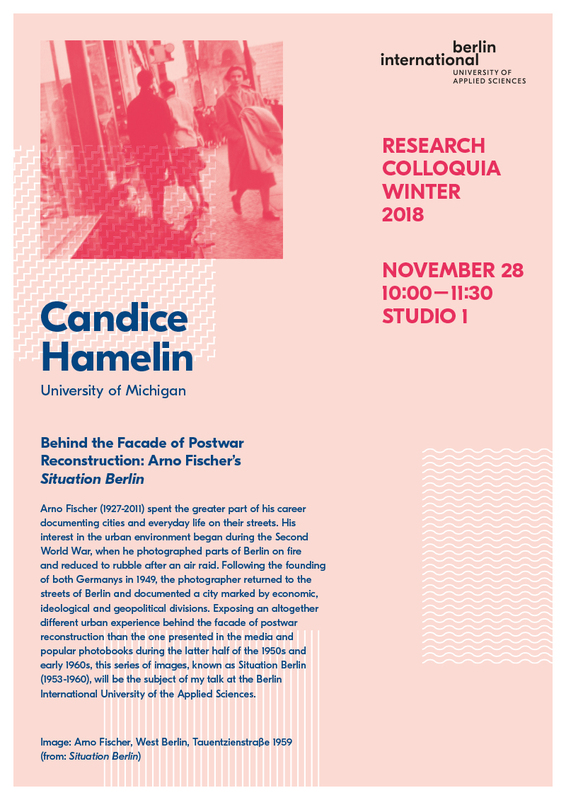 Candice Hamelin about "Behind the Face of Postwar Reconstruction: Arno Fischer's Situation Berlin". You can find all information here. Johannes Steidel about "Innovation Policy in Berlin - background, strategic approach and success". The lecture will take place in Studio 5. Party organized by our students for our students at our new campus. Tomoya Kato about "The sacred places of water in Europe". You can find all information here. Zvi Hecker about "Colorful brutalized". You can find all information here. Jaja Architects about "News from the North". You can find all information here. We proudly invite you to our end of Semester design student exhibition Show 2018. B.A. Graphic Design & Visual Communication, Interior Design and Product Design present their semester projects. 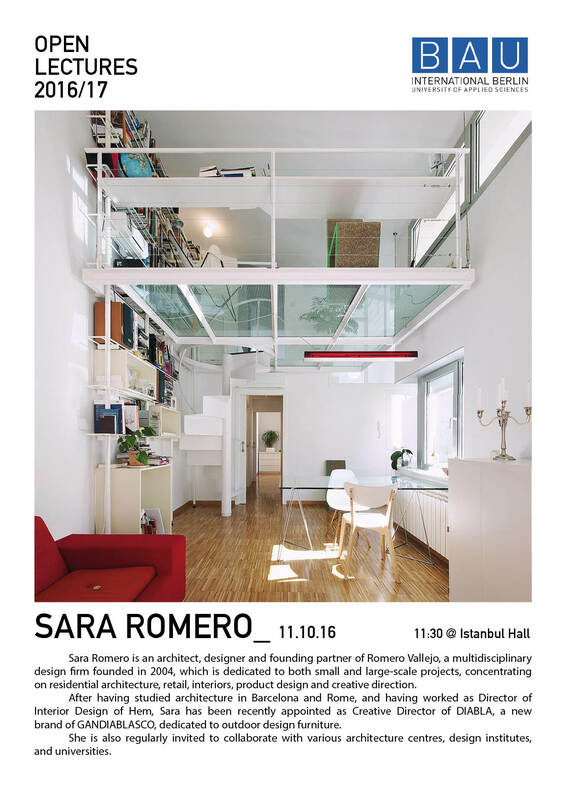 The view starts on Friday 5th October at 16:30h at Room 1 - Room 130. We are looking forward seeing you there! Application Deadline for all students intending to spend the upcoming fall term 2018/19 at Berlin International. Welcome Days for our new students. Meet your new fellow students, explore the university, discover Berlin. Can't decide where to study or what? Graphic Design & Visual Communication, Product Design, Interior Design or Business Administration - Berlin International offers these courses in English! Come and visit our university and get informed about our programs and in touch with our lecturers. Are you interested in studying Design or Business in Berlin? Visit our University and participate in our "Design and Business Workshops" for prospective students. 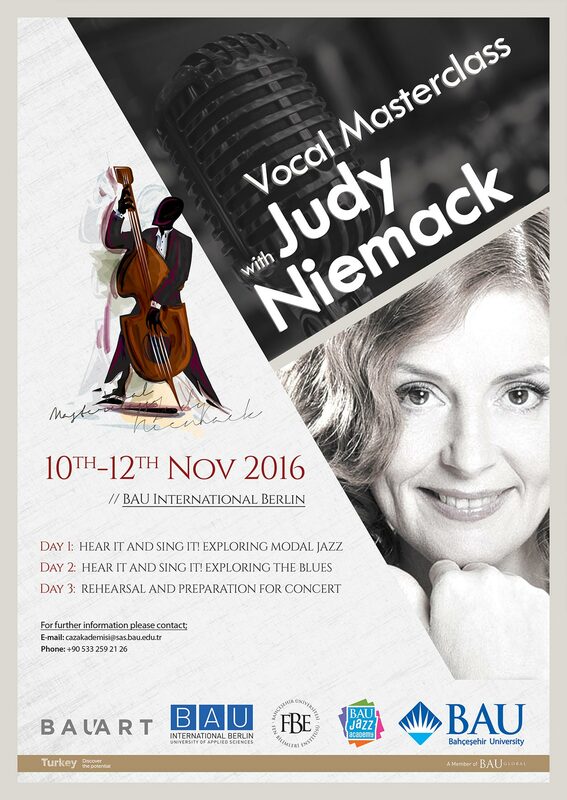 To register, please send an email with the keyword "Workshop" and the study program of your choice to kocak@berlin-international.de. KORHAN EREL & CYMIN SAMAWATIE will be in concert at the Werkstatt der Kulturen Wissmannstraße 32, 12049. The entrance fee is 10 Euros for students and 12 Euros regular tickets. The concert is performed by a composer from Iran and mixes with electronic Turkish roots. Venue: Hallesches Haus - Tempelhofer Ufer 1, 10961 Berlin, Kreuzberg. Admission is free. 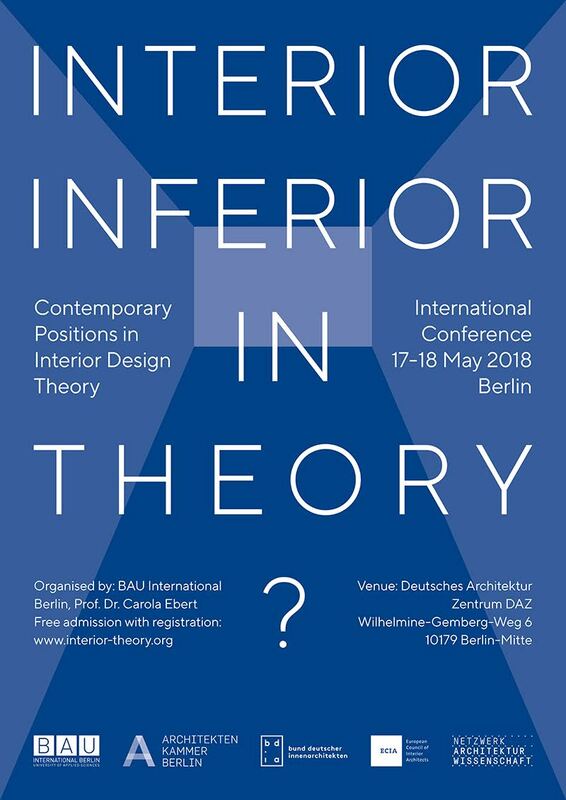 17.+18.05.2018 *International Conference: Interior - inferior - in theory? "Protection and Preservation of Heritage – The tasks oft the Federal State Monument Authority in Berlin (Landesdenkmalamt)"
Sue C. Berning (Technical University Ingolstadt) about "Do Chinese firms choose global or foreign brand positioning strategies?" We look forward to welcoming all of our students back for another productive semester! Deadline to hand in all applications for an Erasmus grant for stays abroad in 2018, both for traineeships and for studies! The semester is almost over and we are proud to present the outcome of our Product Design project: Each student will present his/her personal project. The presentation will be accompanied by an exhibition showing our design process and the final designs. 5 amazing student works on display. We’re delighted to welcome you in our CO-Working Space. Dorit Kluge (HWTK, University of Applied Sciences) will briefly present her research project. The title of her talk is "Rebalancing Tourism and Heritage: Creative Approaches and New Instruments in Demarketing". With Susanne Perner- Updating the Education of Future Entrepreneurs, The Role of Business Plans for Start-ups in Germany in the age of "Lean" Start ups. You can not decide where to study? Graphic Design & Visual Communication, Product Design, Interior Design or Business Administration; Then visit our University to get informed about our programs and get in touch with our lecturers. Are you interested in studying Graphic Design & Visual Communication, Product Design, Interior Design or Business Administration? Visit our University and challenge yourself in our "Design Workshop". Gain inspiration through presentations, hands-on practice and personal conversations. Meet lecturers, students and professors in a relaxed atmosphere to find out more about the chances and potentials of studying at Berlin International - University of Applied Sciences. For registration please send an email with the keyword "Design Workshop" at kocak@berlin-international.de. We proudly invite you to BAUarbeiten, our end of Semester design student exhibition. B.A. Graphic Design & Visual Communication, Interior Design and Product Design present their projects. The private view starts on Wednesday 21st June at 16:00h with a tour. The exhibition is open on 21st June 17:00–20:00h and on the 22nd of June from 10:00 to 19:00h. We look forward to see you there! Application deadline for all students intending to spend their fall term 2017/18 as an Erasmus incoming exchange student at Berlin International - University of Applied Sciences. Please contact our Erasmus Coordinator, Karin Schmidt (erasmus@berlin-international.de), in case you have any questions and to turn in your application documents. Are you interested in studying Design? Visit our University and participate in our "Design Workshop". For registration please send an email with the keyword "Design Workshop" at kocak@berlin-international.de. Application deadline for all students intending to spend their fall term 2017/18 as an Erasmus exchange term at one of our partner universities. Please contact our Erasmus Coordinator, Karin Schmidt (erasmus@berlin-international.de), in case you have any questions and to turn in your application documents. Let's get together at our "Stammtisch" (= an informal meeting in a local pub) this Thursday, 8 PM at "Südblock", Admiralstr. 1-2 - 10999 Berlin (U-Bahn Kottbusser Tor). Use the opportunity to get information on Erasmus possibilities and procedures to spend a term abroad. The meeting will take place in Room 101 and is especially relevant for 2nd semester students - but everybody else interested is also warmly invited and very welcome. Our 6th semester students at the Faculty of Business Administration will present their internship reports. They will introduce their companies, challenges and experiences. Everybody interested or looking for internship inspirations is very welcome. The presentations will take place in the Istanbul Hall. On our bachelor programs Graphic Design & Visual Communication, Product Design, Interior Design and Business Administration interested students have the opportunity to get to know more about Berlin International - University of Applied Sciences. Topics will be among others application and admission as well as global networks (BAU Global). In our "Design Workshop" you can discover your talents in Interior Design. This lecture on the work of the Russian architect Galina Balashova (1931), presents a unique collection of designs for Soviet cosmonautics, these including plans and engineering drawings for Soyuz capsules and the space stations Salyut and Mir. Balashova acted as a consultant to the Buran programme, the Soviet counterpart to the American Space Shuttle. Striving for harmony and beauty, the architect strikes an emotional chord in the high-tech world of carrier rockets, laboratories and survival equipment. The traditional End of the Semester Exhibition of the Faculty of Design, especially for Interior Design as well as Graphic Design and Visual Communication, called „BAUarbeiten“ opened on the 1st of February. Our Product Design End of the Semester Exhibition is called „TOUCH, LISTEN and LEARN“ and opened on February 2nd. 24.11.2016 - 25.11.2016 *Lecture series - "Urban Space and Refugees"
Open workshop for all students interested: "Combining and contrasting educational cultures: How to struggle, survive and succeed at Berlin International"